Why is my cat now so nervous? How can I prevent my cat from getting hairballs? Are you a lucky silver ticket winner? Should I feed my cat wet or dry food? Which lilies are toxic to cats? Cats are little different from us when it comes to traumatic events. Their feelings of fear can take a long time to subside. (Q) My affectionate five-month-old indoor kitten recently escaped. When he returned he was struggling to walk, and a few days later he lost quite a lot of hair. His behaviour towards me has changed too - he seems scared of me while downstairs, is very on edge and keeps his distance. However, at night he still sleeps on the bed with me upstairs. What could be wrong with him? (A) Behaviourist Jon Bowen says: Your cat must have had a serious fight, a fall or been involved in a road accident. Presumably you took him to the vet for a check-up, because he could have had internal injuries that were not visible. Cats are little different from us when it comes to traumatic events like this. Their feelings of fear can take a long time to subside. 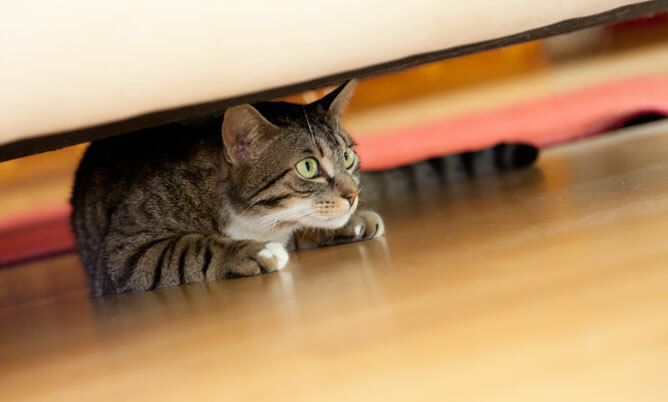 Clearly your cat feels less secure on the ground floor of the house - in some ways this fits with a cat's typical preference to be higher up because this offers protection from attack. If he has had conflicts with neighbourhood cats then perhaps he feels vulnerable on the ground floor where he might be able to see cats in the garden, or where cats may even have come into the home without you knowing. Make sure that the house is secure for him so that there is no possibility of home invasion by other cats. Ensure he has a continuous supply of food and water downstairs so that he can eat and drink at will. Give him some places to perch on and low to hide in when he is unsettled or nervous. Install a feline pheromone diffuser on the ground floor, as these have been shown to reduce stress in cats. Lastly, you should take a 'hands-off' approach with your cat for the next few months. When he is downstairs, don't approach him or initiate physical contact; talk to him, glance at him and put food treats on the floor for him to eat, but don't pick him up or try to befriend him. Let develop confidence and take initiative with you. It will take a while but your should settle down. If he doesn't, you see any signs of ill health, to your vet in case your cat damage due to whatever accident happened to him.